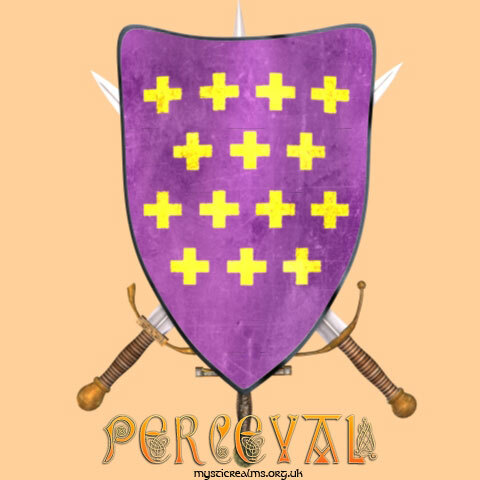 "Sir Percivale, Whom Arthur and his knighthood called the Pure." Perceval's father, a knight, dies and his mother, seeking to avoid her son following his father's path retires with him to the country. But fate is inexorable and when he is 15 Percival sees a party of knights and resolves to be one. Percival travels to Camelot, proves himself and is invited to join the Knights of the Round Table. 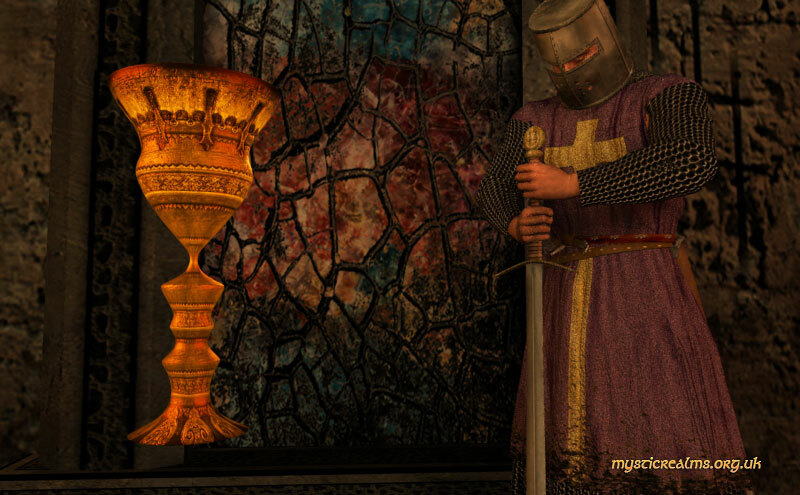 Percival is one of the knights who undertake the Grail Quest and after several adventures which demonstrate his worthiness, Three knights, Bors, Percival and Galahad achieve the Grail. Becoming Grail Knights and passing with the Holy Grail to the Grail Island. 'PEREDUR' is unique in that a bleeding head on a platter takes the place of the Grail. 'Peredur comes to the castle of an uncle, who is lame and whose attendants fish in a lake nearby. next Peredur goes to the castle of a second uncle, after a feast his strength is tested. Two youths enter carrying a spear from which flow three streams of blood. They are followed by two maidens who bear 'a large platter between them, and the head of a man on a platter, and blood in plenty round the head.' ('a dyscyl vawr y ryghunt, a phen gwr ar y dyscyl, a gwaet yn yn amhyl ygkylch y pen. ')....great lamentation ....Peredur falls asleep..many years later a loathly damsel berates him for his failure to ask about the bleeding lance - if he had done so the king would have been restored to health and his land to peace. Peredur vows to learn the story of the lance. Later he comes to a castle - gray-haired lame man - explains the head was Peredur's cousin.- Peredur avenges his cousin by slaying the sorceresses of Gloucester.